TS ePASS Required Documents for Renewal as well as New Registration is available here. Students who want to apply for the TS ePASS Scholarships must correctly carry the Document for the Counselling. Hence, the candidates can then only apply for the Reimbursement. Students must take few relevant Documents while applying for TS ePASS. Students who are Economically Backward will prefer the Scholarship Concept. Therefore, Individuals must be careful while checking the documents. The Application will get Rejected due to any reasons. That’s why we have carefully mentioned the Reasons behind the Rejection of TS ePass Application Process. Therefore, fill the application form clearly with Correct information. 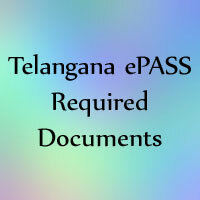 Check the complete list of documents required for Telangana ePass. While Submitting the Application form along with the Hard Copies, check the below details. If a student is not bonafide. Not recommended by Field Officer. If the student is not present physically. The Student admitted under management quota. Missed submitting Caste, Income certificates. Nonsubmission of hard copy of the application. Nonreceiving of hard copy for Fresh. Therefore, the Students should check carefully, So that no such cases happen while completing the Application Process. The Documents for New Registration and Renewal of TS ePass are different. So the Students should note the TS ePASS Required Documents. Therefore, check the information given below and follow them. Mark lists according to their Qualification. Bank account number and details. Therefore, those who apply for the first time should register their Aadhar Number along with their Parent’s Numbers. The Ration Card Details and Income Certificate are mandatory to confirm their Financial Status. Caste Certificate is only for BC, SC, and ST. The OC Candidates who are Economically Backward should have EBC Acknowledgement. Resident Certificate became the Prominent one after the Division of Telangana from Andhra Pradesh. Bank Account Number is a must and should one as the Government will pay to the Colleges through it. While doing the Renewal Process, the Students should also carry the previous year application Number. Most of the Students may don’t have the Application Numbers. So, they can check their Numbers in the Official Site. Therefore follow the Steps below. The Home Page will appear as shown below. There are many open in the Home Page. Click on the Know your Application Number Button. The Page appears as follows. Finally, fill the fields required and click on search button. Hence, the Students who lost their Application Numbers can use this procedure. The List of Required Documents is available in detail. Check and carry them while applying. Marks Memo of the Previous Semester. Therefore, the above-mentioned details are necessary while applying. In some rare cases, there may be a necessity of the below-given documents. Hence, the Students must have the Documents & Certificates mentioned above. Some of the Documents are mandatory for TS ePASS Renewal 2018-19 process. Therefore, check them below. Marks List of the Previous Semester. Once the Information entering is completed, the Complete information is entered into a 10 Rupees Bond Paper which is the main Document for the Renewal Process. Because of that Process, sometimes the Application is rejected. Therefore, be careful while doing that. As a result, the Candidates can check the Status after completion of Telangana ePass Application Process as well as Verification. Hence, for any details about TS ePASS Required Documents visit the official site mentioned above.